Oats, known scientifically as Avena sativa is proved to be good for health in many ways. According to “The World’s Healthiest Foods,” Oats are the most nutrient-rich out of all the grains. Excellent source of manganese, good source of fiber and vitamin B, high in protein, helps lower cholesterol, stabilizes mood by maintaining blood sugar, and available year round. Why is oats good for your kid? Oatmeal's whole grain, high fibre and protein attributes are believed to be some of the primary factors that influence spatial memory performance in young children. 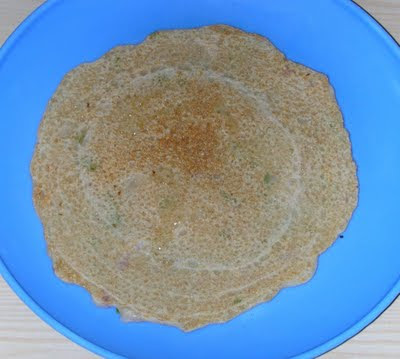 Dosa being a common breakfast item in many Indian households, the oats variation is a nutritious option. Mix all the ingredients in a bowl and let it soak for half an hour. Spread on girdle and fry both sides till crisp. Hi, Here We have to use cooked oats or the instant oats like Quaker Oats. I have used Quaker Oats in this recipe. Hey, I give oats kheer to my daughter. I just use some milk, sugar and rolled oats for 3-5 min on gas and kheer is ready. Do you know if I need to roast the oats like we do 'daliya'? If you are using quick oats there is no need to roast it, it can be used directly. Wow, I will try this one, it's healthy and quick. I just have to get semolina.